The leading global manufacturer of high-end visual display products, Eizo Nanao Corporation has announced its new ultra-thin 23-inch FlexScan EV2303W and 20-inch FlexScan EV2023W, which the company claims as the world’s first monitors with TCO Displays 5.0 certification, incorporating new integrated EcoView Sense feature that can automatically switch the monitors to power save mode while the sensor does not detect the user for 40 seconds, aiming to offer users a convenience and energy savings experience. 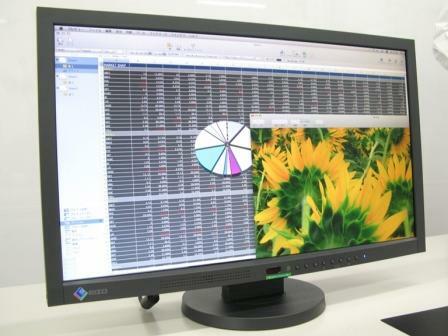 According to EIZO, the new FlexScan EV2023W features 1600 × 900 pixels resolution, 178° viewing angles and 3000:1 contrast ratio, while the FlexScan EV2303W includes 1920 × 1080 pixels resolution, 160° viewing angles and 1000:1 contrast ratio, featuring same 250 cd/m2 brightness, 1 D-Sub (analog) and 1 DVI-D (digital) input. In addition, the FlexScan EV2023W and EV2303W will operate at up to 40% greater energy efficiency, thanks to the Auto EcoView sensor measuring ambient light and optimizing the display’s brightness to ideal level. The new sleek EIZO FlexScan EV2303W and EV2023W LCD monitors are expected to be available starting May 21, 2009 for approximately $385 and $458, respectively.